Here, 8th grade math worksheet2 on math is given. You can do the problems on this work sheet and also check whether the answer you have got is correct. In this page 8th grade math worksheet2, you can find 10 problems on math which are in the level of 10 th grade. 1. Find the smallest number by which 3087 should be multiplied to obtain a perfect cube. 2.11025 students are sitting in a lawn in such a way that there are many students in a row as there are rows in lawn.Find the number of rows in the lawn. 8.The numerator of a rational number is less than its denominator by the number 3. if the numerator becomes three times and the denominator is increased by 20, the new number become 1/8. Find the original number. 9.In a circle with center O and the radius 13 cm, AB is a chord of length 24 cm.Find the distance between the chord and the center. 10. 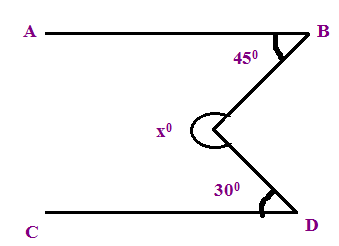 Find the value of x ° if the lines AB and CD are parallel to each other. These are the questions on math prepared in 8th grade math worksheet2 based on the curriculum of 8th grade.